I have spoken with you at length about my amazing and talented grandfather. What I haven't stated is that he is struggling through the late stages of Alzheimer's Disease. It has been painful to watch such a brilliant man forget... forget so very much. My grandmother has asked me to write little stories and sentimental snippets from my life with him so that they can read them together. I may post bits here, like the piece about the hardware store, so I thought it important to share the significance with you. I will be sending him a few stories for Christmas with these newly carved deer gift tags. 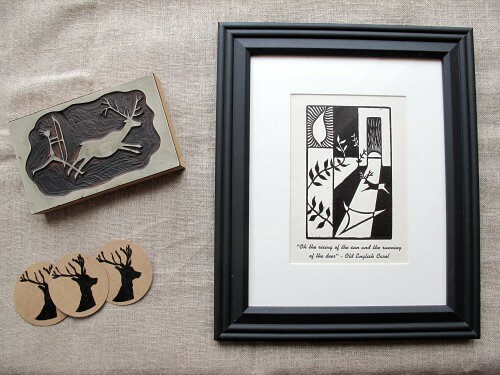 They are a simple ode to the beautiful block print cards he created for the holidays throughout the 50's and 60's which often featured a deer silhouette. This framed one hangs in our living room and the block is one of my most cherished posessions... it lives in my studio. I look at it daily. I'll be sharing more photos of my shop update offerings later in the day, but since these gift tags will be part of a larger holiday tag set, I didn't want them to get lost in the shuffle...or considered just another (trendy) deer silhouette. Nope. I knew you'd be interested in just how special they are to me. You're thoughtful that way. Thank you. 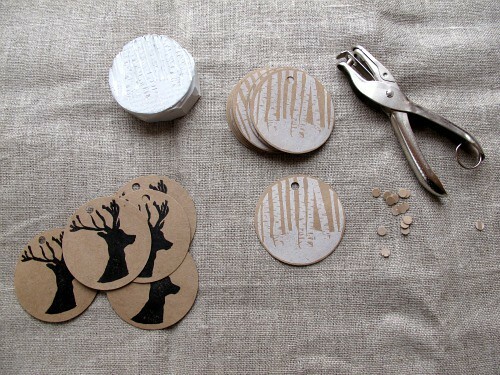 The birch forest tags? Oh, I just love all things snowy and white. I pass by this forest everyday so they are always on my mind. Sorry to read about his disease, but thank you for sharing that amazing framed scene, it;s beautiful, as the tags. Such a difficult thing to go through. My heart goes out to you all. Your Grandfather is an exceptional artist... that card and stamp are stunning. I look forward to reading more of your stories and seeing more of his art. I'm not quite sure what to say except thank you for sharing this. His art is a beautiful reminder of an exceptional man. My thoughts are with you. I lost my dad to Alzheimer's in 2003. It really was a long goodbye. He was an artist, too, and I love having his watercolors hanging in my house, as a remembrance of his happier days. You are in my thoughts, and I send comfort and peace your way. My grandmother is now in a special home for Alzheimers. It is incredibly difficult to watch her deal with the disease as well - almost as if she is living backwards. Hang in there,and remember him through all the stories you write down for him. Thanks for your gentle and kind comments. When I wrote this post last night my intention was to shed light on something my family has been quietly living with for years. I realize in the light of day that this was a little heavier than I had planned. As trying as it is, there has been time to adjust at each chapter of his illness. I feel grateful for the gift of the "long goodbye" as Karen so eloquently put it. So there is sadness, oh yes, but mostly I'm thankful for the extra gift of time... and another holiday that I get to send him something special. I am so sorry to read this. His artwork is beautiful, and how wonderful that his inspirations live on through his granddaughter and inspire in turn. This a beautiful story accompanied by two timeless, peaceful deer. Thanks for sharing, Maya! I love the print. So graphic, so beautiful. Having been through "the long goodbye," I wish your family lots of memories of the good times. It is a cruel disease, but the good memories help. Your grandmother has the right idea! Your stamp and tags are lovely. What a blessing and gift you are giving by writing down those stories of Deer Grandfather. I wonder if some of the stories will spark his memory of the old times? These recorded memories will be special to your children one day too. I am so very sorry about your Grandfather's illness. I too am going through a similar situation. My father has cancer and so everyday we have with him still, is a blessing.Not long ago we tape a moment between him and his great grandson,discussing his life in the 1940's for a class project. It was wonderful to listen too, and we will treasure the dvd always. Have you ever seen a web page called blurb.com. There you can publish your memories in a beautiful book.The prices are not outragous for what you receive. I think it starts at 24.95. I am gathering things to do one for our family. such a terrible and tragic disease. your family is in my thoughts. your grandfather's spirit is clearly in you though - you are both great artists. Your family is in my thoughts and prayers. It is, indeed, a cruel disease. I am certain that the moments and memories you share with him will be so special. what a pretty post...both in words and photos...i love your tags and you have a real keepsake in your deer block and print. your grandfather will really appreciate your thoughtfulness and creativity. hugs to you and your grandmother.